Thuja Occidentalis, known also as Eastern White Cedar, Northern White Cedar, Eastern Arborvitae, Cèdre Blanc, Yellow Cedar or Thuya du Canada happens to be an evergreen native to North America, with the common name derivating from its lighted color of the wood. 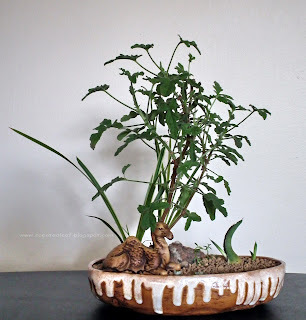 Native trees are always a plus in growing bonsai since are easier to deal with climate conditions. White cedar is a member of Thuja genus, North American Cedars, ideal for bonsai, featuring deadwood, shari and jin. 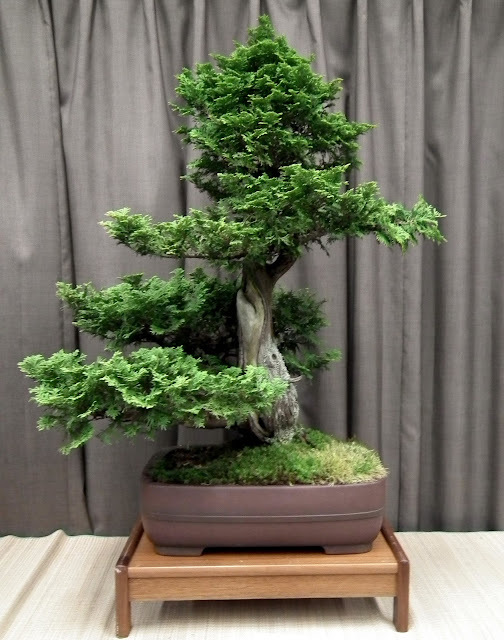 The photos depict nice specimens featured last spring at Taguchi Bonsai Show 2011. 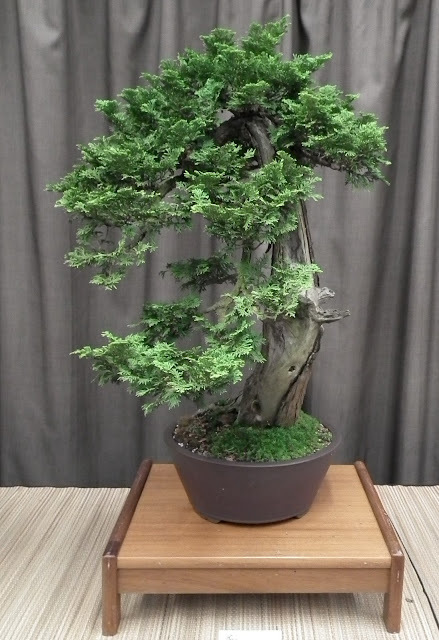 There is no problems wiring branches, either to pruning and pinching - it is a dwarf tree with relative small foliage having an almost pruned look, which do back buds on younger twigs and on the trunk, close to the old branches and has the ability to produce new branching. In the wild, its age can exceed 800 years - so it is one of the oldest trees of North America's woods. Its fibrous bark, red-brown to gray is a plus since it give an old appearance to bonsai. Accordingly with "Flora of North America: Pteridophytes and gymnosperms" book, published by Oxford University Press in 1993: "Thuja Occidentalis is widely utilized in ornamental silviculture and has more than 120 cultivars and was probably the first North American Tree introduced into Europe (ca. 1566). It is an important timber tree; the wood is used for applications requiring decay resistance. (p.411) "
Eastern White Cedar is a relative fast growing evergreen tree and, when young, it had a pyramidal shape and the shoots are flattened with short points and opposite fan-like leaves. 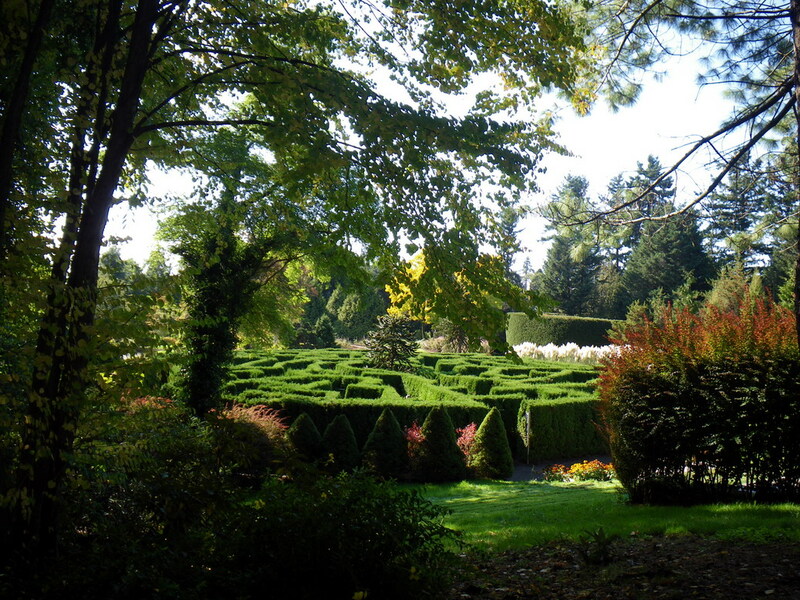 It is very popular in landscaping and in Vancouver's parks and gardens is used as an ornamental tree and hedging plant. Its timber is widely used for log cabins, poles, wooden-ware, paneling and rustic fencing. VanDusen natural Hedge Maze , the most impressive living labyrinth from British Columbia, has been created with up to 3,000 Thuia Occidentalis. 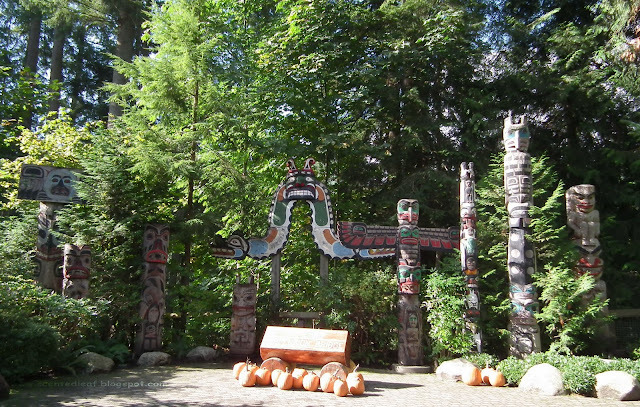 Minter Gardens' logo, has been also realized with thuja occidentalis. Thuja Occidentalis is also present in Kia Palano Totem-Poles Park from Capilano Suspension Bridge park and nearby Totem-poles and Coast Salish Gateways from Stanley Park. Similar with other conifers, the foliage, the fruits, the bark and the wood are strongly scented. 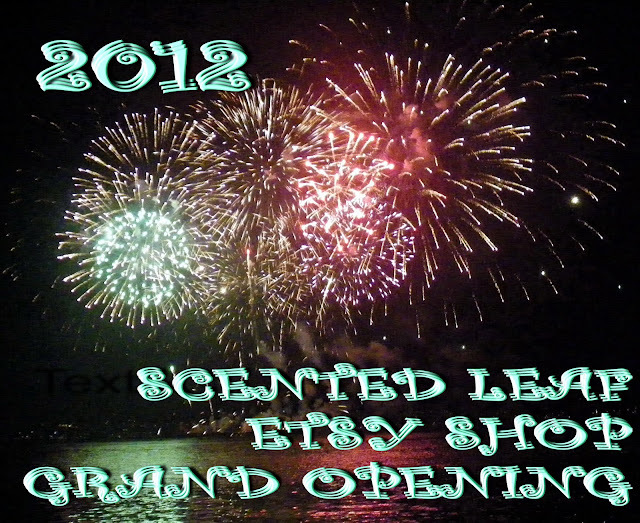 The essential oil extracted from plant it is widely used in cosmetics products, homeopathic remedies and medicines. 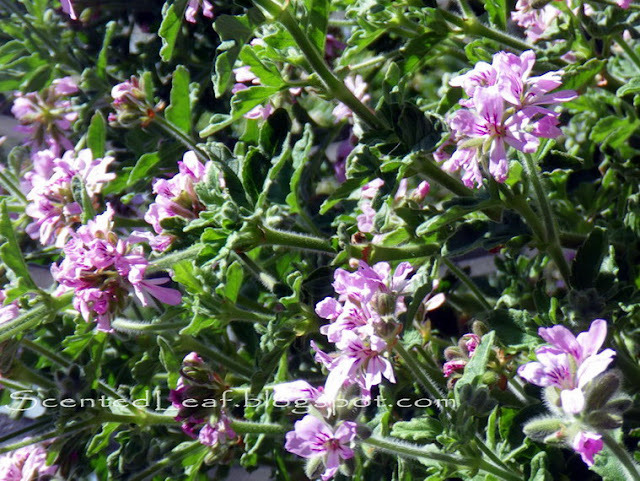 The foliage is also rich in Vitamin C and is used to make disinfectants, tincture and teas against constipation and headache. Thuja Occidentalis is also a beneficial plant for wildlife habitats and source of nutrition for white-tailed deer, hare, squirrels and birds. Who can resist to the beauty of a Rober's Lemon Rose pelargonium? Its soft and hairy delicate leaves call to those who see it, begging people to touch and smell them. One of the most prized scented plant in our garden, it has an intriguing evergreen foliage exuding by a pleasant lemon-rose aroma with irregularly lobed and toothed shape. 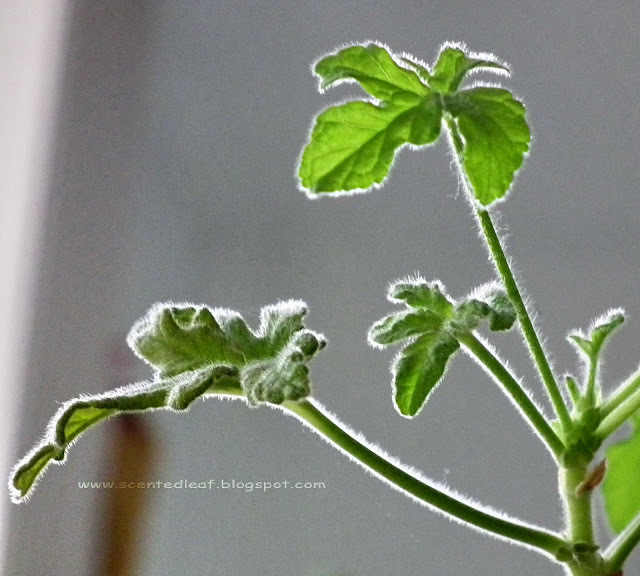 Some said that the leaves resemble the tomato leaves, perhaps for the triangular shape of the leaves and the hairy looks of them. 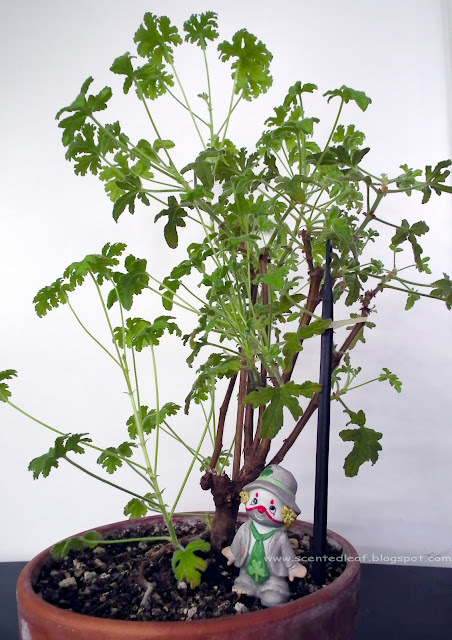 Rober's Lemon Rose is another larger-leafed pelargonium cultivar which hasn't a problem with watering, it is really tolerant to over- or under-watering due to its tuberous roots. 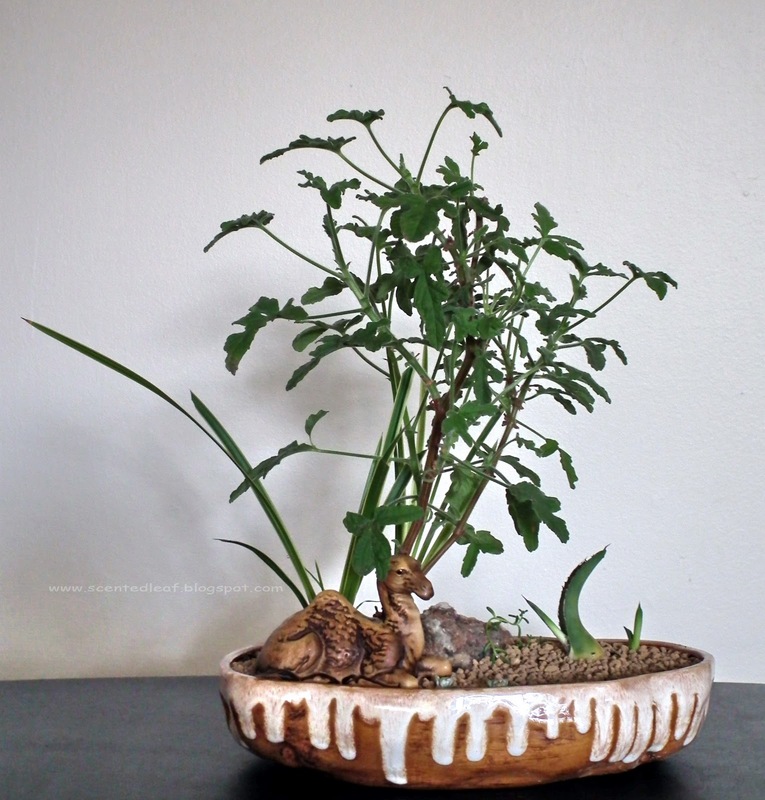 It has a robust, upright growing habit; has semi-woody stem and its leaves respond well to reduce their size when potted in small pots ... these making it a good candidate for miniature gardens or bonsai. In the last few years we have grown nice specimens of this variety. We are sure that it is a hybrid, although we still have some doubts about the real origins of this cultivar. Unfortunately, like some other hybrids, there are no viable seeds produced from the multitude of flowers when in bloom and we propagate them by strong and healthy cuttings from mother-plant material. In the "Aromatic Pelargoniums", (1974), Roger Swain referred (page 106) Pelargonium Rober's Lemon-Rose as a Pelargonium Graveolens cultivar. On the "Pelargoniums Guide" published on the "The Herb Society of America" website, Pelargonium Rober's Lemon - Rose it is also referred (page 23) as a Pelargonium Graveolens cultivar. 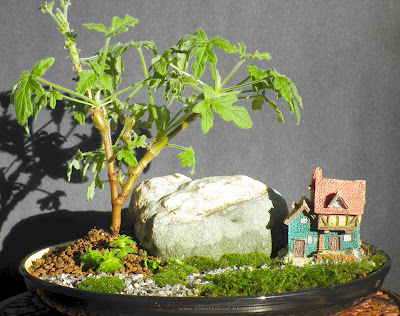 In addition to other published books and online scientific works where it is reffered as a Pelargonium Graveolens cultivar, I found on "The Encyclopedia of Herbs" by Arthur O. Tucker and Thomas DeBaggio, at pages 375-376, that 'Rober's Lemon Rose' is a hybrid of Pelargonium Graveolens x Pelargonium Tomentosum that came from Ernest Rober in California in the 1940's, but the morphology and essential oil pattern suggest a chimera of Pelargonium Graveolens. Why I was digging about it? I'm sure next pictures might lead you to think about their origins, too. Please let me know if you found some more info. My challenge to you is to appreciate this unique foliage of a Rober's Lemon Rose stock plant, which become last year a "two-in-one" plant. If you look closely you'll find what I am talking about. 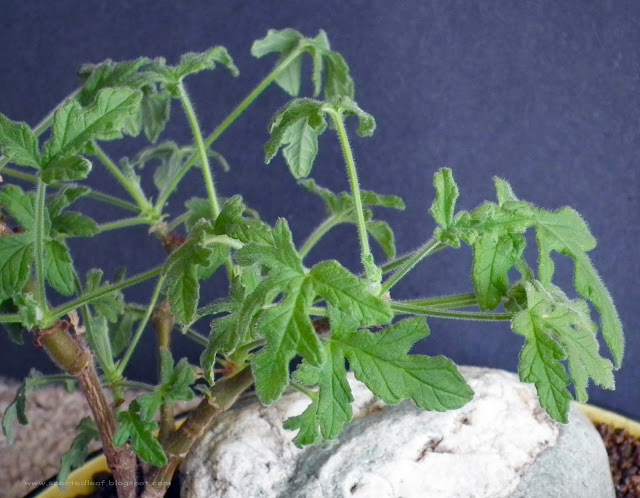 Two in one pelargonium sport; different leaves shapes and fragrance. What are you thinking about its sports? 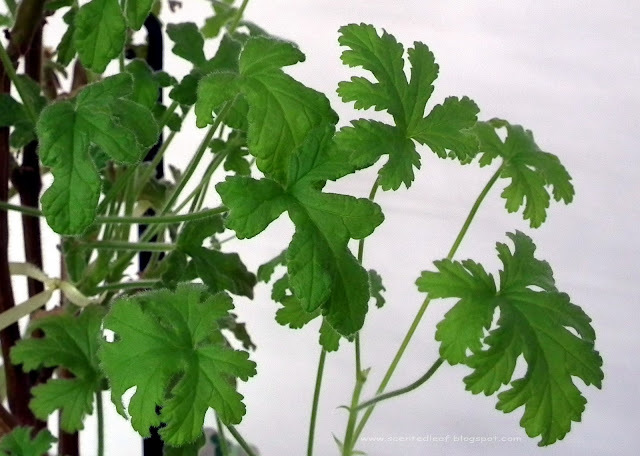 Is the look of new leaves inherited from its parent: Pelargonium Graveolens?